We're wrapping up this mini series on surviving the pollen today with this trifecta! :D It's crazy popular... and there's a reason for that. It. Works. 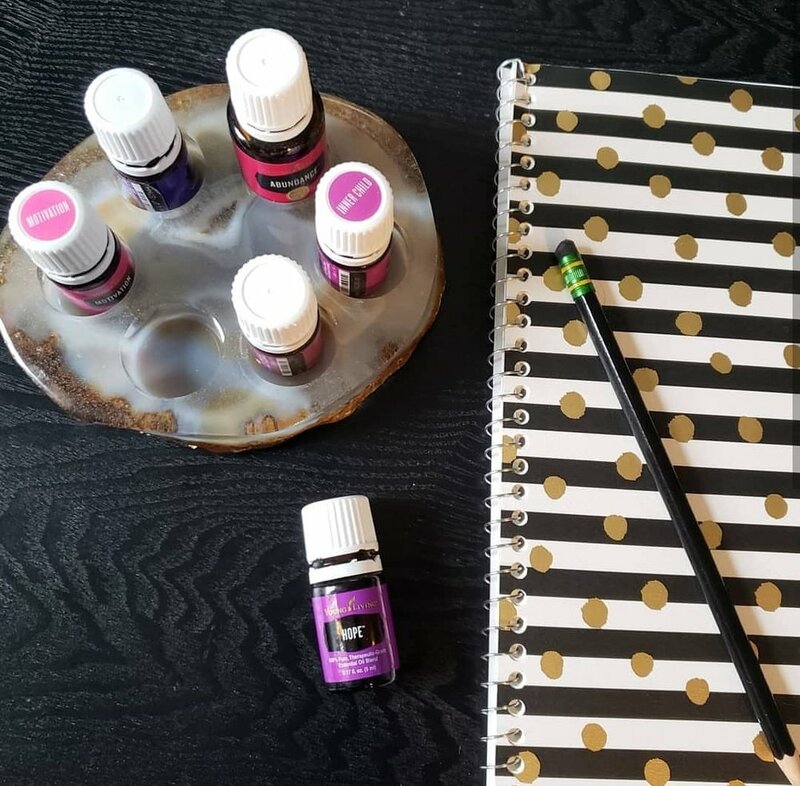 I know it's hard to believe but these three oils together work wonders to help us ease into the spring season feeling great. Here's how we use it in our home. We put three drops of each in the diffuser and keep it going most of the day. It helps all of us to breathe it in and the aroma is so fresh and energizing! Win/Win. I put ten drops of each into a 10 mL roller and fill it to the top with V-6. We roll it on our wrists, under our nose and on our temples several times a day. Sometimes... you just need to take the trio internally. So I put two drops each of the Vitality versions of these plus Copaiba Vitality to enhance their effectiveness. A tiny bit of V-6 tops off the capsule and we take it with a big glass of water. Easy, peasy. These two posts have been added to our blog so feel free to share them with those you know would benefit from the information! Say hello to LOTS of beautiful, thoughtful, safe and effective new products from Young Living. Yay! We are all especially excited about the new oil, Body Butter Collection, Sandalwood Hydrosol Spray and the Insect Repellent Wipes (coming soon)! If you’re using our Savvy Minerals Make-Up… you are going to absolutely love these new additions that make cleaning off your face and brushes easier and more enjoyable. These new goodies are Quick Order only for now and will be available to add to Essential Rewards order on May 1st. BUT… some have already sold out. So if you have your heart set on certain things… go scoop them up now before they are gone! It's SUPER simple to throw together. Just empty your jar of Rose Ointment into a small bowl, add ten drops of Lavender, mix it up and put it back in the jar. I keep a bit of purple washi tape on top so I know this is the under nose one. Everyone always asks me if you can just use coconut oil. Of course you can! You can do whatever you want. :-P BUT... the Rose Ointment is extra thick and I think it works better at providing a protective barrier from the pollen. Say hello to this month’s freebies! They’re SO GOOD and it is worth mentioning that the 400 PV tier is valued at almost $200. Woo hoo! This means that you are getting 50% of your investment this month back in freebies PLUS another 10 to 25% back in ER Points depending on how long you've been in the program. Sooooo we're basically getting paid to shop from YL! It's better than any other credit card or store reward program out there. Not to mention that the products are safe and effective and our company does so much good for the world. This lifestyle is affordable for EVERYONE. Don't spend more. Spend better! Let's look at how a day with these goodies could look for you and your family. Wake up and get some Lemon and Vetiver in the diffuser. It'll help open your ears for intentional listening from Daddy God and your family so you can set the tone for an energetic, positive and purposeful day. Rub two drops of Clary Sage on your lower abdomen to help reduce PMS and menopausal symptoms. PRAISE. You will enjoy the mild spring-like aroma, too! Mix a drop of Goldenrod in your palm with a small amount of YL's 15 SPF sunscreen and massage into your face and chest before applying make-up. It makes a great primer for our Savvy Make-Up and helps to firm up and protect your skin! Take Tangerine to work with you to keep the positive vibes going in your car and office by huffing it out of the bottle or diffusing it with Peppermint. Send your kids to school with a Lemon and Vetiver roller to help them focus and learn! Split up the Lavender Bath Bombs into two or four pieces and drop one of those in a container of warm water for a relaxing foot soak after work. Get Dream Catcher in the diffuser in the evenings to help everyone wind down and to bring the aromas of a blooming spring garden into your home. Which ones are you scooping up this month?! How are you going to use them?! Please share your knowledge and excitement with all of us! We've got a pretty big to do list today as we prepare to get our house on the market in this week! As I stared at my list about an hour ago, I began to notice a struggle to breathe normally. (Because, stress.) So I got four drops of Raven and Lemon in the diffuser and put my head over the top so I could breathe it in deeply. Sometimes being willing to focus on the most basic human function (breathing) can settle me quickly and get other things into perspective. This morning... it was almost instant relief. As soon as I made this decision and inhaled those oils I could feel my chest open up and my breathing go back to normal. This Starter Kit combo will stay in the diffuser today! It'll help me and everyone in our home... at the same time... with the same eight drops... for hours! This tip is from Jessica Lederer… a Gold leader in Frank and Valor! It’s been well loved in our team exclusive hang out group and we knew it deserved a spot on our blog for the world to see. Stress Away is an oil that is included in our Starter Kit. It is a blend of Copaiba, Lime, Cedarwood, Lavender, Ocotea and Vanilla. 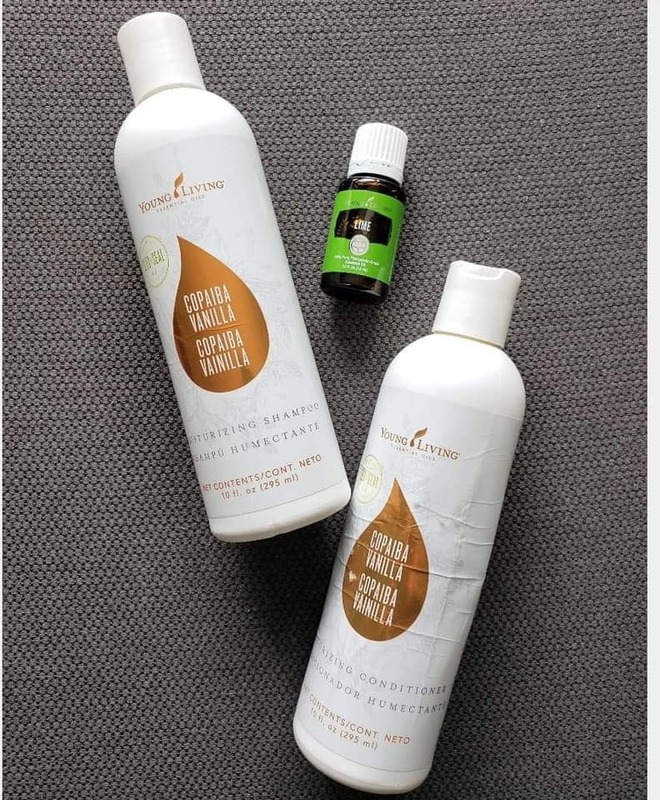 So our Copaiba Vanilla Shampoo & Condition are the perfect base to create your own Stress Away Shampoo! Simply add twenty drops of Lime and ten drops of Lavender to your bottles, shake and ENJOY. IT’s a great way to add oils to your routine without even realizing it, too. Plus… our hair products are completely plant based which is really important because your scalp absorbs three times faster than any other part of your body. So make sure it’s absorbing none of the bad and all of the good. Do you ever wonder which diffuser would be your best pick for certain rooms and situations?! Young Living has us covered, friends! This Diffuser Comparison Chart is such a great resource! I always refer to it before I purchase a new diffuser for our home, office or vehicle. It goes over features, square footage covered and more. Remember... even if you aren't applying your oils topically or ingesting them everyday... breathing them in is SO POWERFUL and it's a great opportunity to get out the stuff that harms (candles, air fresheners, etc.) and bring in the stuff that helps (oils!). Not a member yet? Click HERE to contact us so we can help you find the right Starter Kit for your family! When your Bottles are "Empty"
Have you guys seen this trick before?! It makes its way around the internet several times a year and I'm not sure I ever shared it here. So... here we go! Simply remove the reducer cap from an almost empty bottle of oil and use this trick two different ways! 1 -The wooden toothpicks can act as little diffusers because they will wick up any drops of oil that are leftover in the bottle. Stick it anywhere in your home (or car) and enjoy the aroma for several days! 2 - Instead of popping mints or gum... use these as little chew sticks throughout the day! They're far healthier and work great. My personal faves are Peppermint Vitality (energy, fresh breath and to curb nausea) and Cinnamon Bark (immune system support and to reduce sugar cravings). Enjoy knowing you're not wasting any of these precious oils! Every drop matters! We are wrapping up our laundry room ditch and switch today! Do you know which household product contains the most formaldehyde? Dryer sheets. :-P Why do we use them?! To scent and soften our clothes. Is there another option?! Heck yes! Wool dryer balls! Simply put a drop or two of your favorite essential oils in three or four balls and throw them into the dryer with your clothes. They do everything dryer sheets do... except cause cancer, skin irritations, respiratory disorders and hormone disruptions. So, yeah. A bit of an upgrade, right?! If you still get static when using dryer balls, reduce your drying time! Sometimes over drying will cause static. You can also attach a safety pin to a few of the balls before throwing them into the dryer. But, hey. A little static is better than the side effects of dryer sheets, right?! If you do multiple loads in a day there is no need to add oils every time! I usually do two drops each on four balls for three loads. This costs pennies if you use cheaper oils like Lemon, Lavender, Citrus Fresh, Lime, Orange, etc. These make great gifts! Put four of them in a pretty bag with some Lavender to bless someone else with a toxin free option they'll love and use all the time. If you missed the other posts in the series... they're linked below! Shop for our favorite dryer balls by clicking HERE. Let's continue our series on laundry room ditch and switch opportunities with two fun DIY products! We're talking... a scent booster and a stain stick. Whoop! I rarely use either of these because I think the hacked Thieves Laundry Detergent does an awesome job all on its own but for stinky towels or extra stained clothes... they're great to have on hand and they'll prevent you from picking something toxic up at WalMart or Target. Yay! Mix all of these ingredients together in a small bowl and pour into an airtight container. I reused an old scoop from our Thieves Dishwasher Powder and throw a scoop of this scent booster in with the Laundry Detergent when I want extra smell good clothes, sheets and towels! Some of my favorite oil combos are Citrus Fresh, Lemon/Thieves, Stress Away and Eucalyptus/Lemon. Add these two ingredients to a 30 mL roller and shake well. Roll onto tough stains right before washing as a pre-treatment. The opportunity to ditch and switch in our laundry room is HUGE because we're absorbing the products we use to clean our clothes and towels all day long. At night when our bodies are supposed to be resting and rebuilding... we're filtering toxins from our jammies and sheets instead. BLAH. It's no wonder immune systems are so weak these days. This is no coincidence! So let's talk about a hack you can use to get rid of any excuses (time or money) that may be holding you back from more wellness! 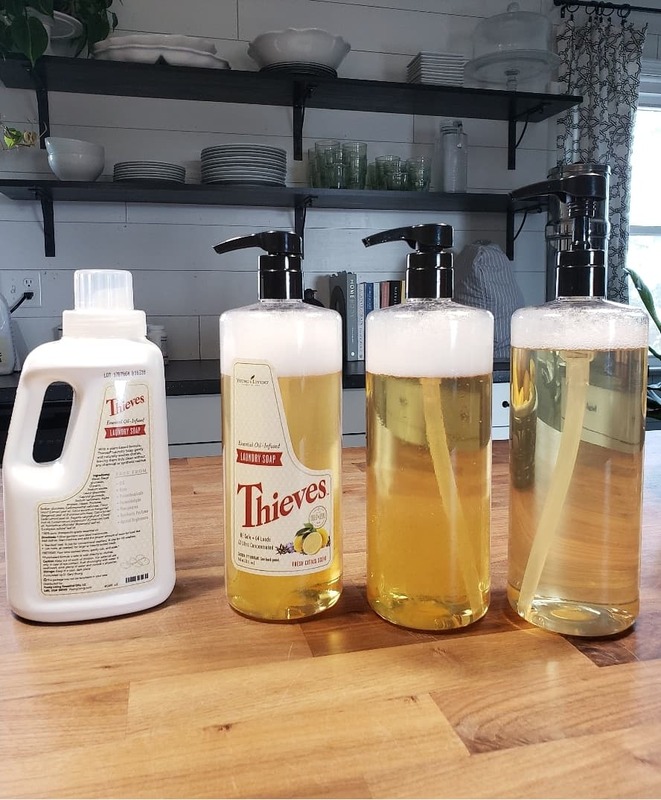 Did you know that you can turn our thirty-two ounce Thieves Laundry Detergent into THREE thirty-two ounce bottles?! You don't pay for water with YL products, friends! They're highly concentrated and still work great when diluted. 1 - Pour 1/3 of your Thieves Laundry Detergent into a thirty-two ounce shampoo pump bottle. 2 - Add two caps of Thieves Household Cleaner. 3 - Add ten to twenty drops of Thieves or Lemon. 4 - Fill to the top with distilled water. We use three to four pumps in each load depending on how much we are washing. You can even remove the label from your YL detergent bottle and reapply it to your pump bottle so you always know what is inside. SO. EASY. Purchase these bottles from our Oiler Must Haves web page! Click HERE to shop! Not a Young Living member yet?! Go back to the person that send you the link to this blog post for their link to order a Starter Kit. If no one sent you here and you want to join with our founder Ashley Sharp… click HERE. You can get a Thieves Starter Kit and be leaps and bounds ahead with ditching and switching with just one purchase! If you have a partially used bottle of Thieves that is 1/4 to 1/3 of the way full... it's the perfect time of year to fill it up with V-6 and put a roller fitment on top! Add all ingredients to a glass and top with ice. Enjoy! You can also use AminoWise to replenish fluids and soothe tired muscles after a run in with a stomach bug. It’s far more nutritious than Gatorade and doesn’t contain harmful dyes, flavors or sweeteners! 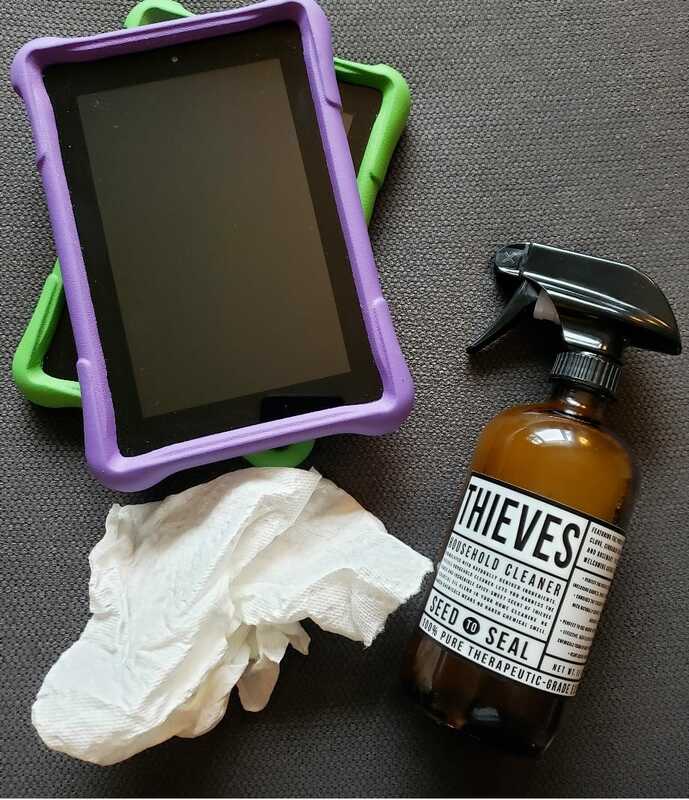 One easy chore the kids have every few days is to wipe down their tablets with Thieves Cleaner. Whyyyy?! > Because, gross. They sneeze and cough and breathe on these things and touch them after they've touched all the things. > Thieves Cleaner is safe for them! In fact... it loves on their immune systems as they use it. WINNING. > It's the same cleaner I use for everything. I don't have different dilutions for different surfaces. It's one to two cap fulls in this sixteen ounce bottle (and some Lemon and Pine if I'm feeling extra) and DONE. Every surface. Every job. My easy button... and theirs, too! PS - I also do this to my cell phone when I come home from the gym and after running errands! This year... don't stop at waiting for your breakthroughs. Let this year be the year you actively receive them! It's human nature to back off from the things in our heart because we aren't getting results. That's why FAITH is so important. We need to be willing to move towards what we want even if we don't see it working out. We need to be willing to believe that God is working out everything for us even if we aren't experiencing it yet. We need to be willing to ask The Spirit where to go, what to do and who to talk to because He always puts us at the right place with the right people at the right time. Because, friend. If it's still in your heart... IT'S STILL FOR YOU. Don't stop two feet short of gold. What are you asking God for this year? Tell us! We want to stand with you! I had about an hour this afternoon to do three hours work of work. Can anyone relate? So I needed to make the most of my time at the computer which meant some serious focus! My go-to for focus help is Clarity and I always have a bottle at my desk. It's a blend of Basil, Cardamom, Rosemary, Peppermint, Coriander, Geranium, Bergamot, Lemon, Ylang Ylang, Jasmine, Roman Chamomile and Palmarosa. Those oils work so well together to activate cognitive function while keeping negative, anxious and tense emotions away. I simply put a few drops in my hands and massage it into my temples and forehead every few hours. Breathing it in deeply also reigns in distractions! I shared this DIY tip in my team’s group on Facebook last November but I think it's worth a repeat here publicly because it's SO FAST to throw together and it's SO DANG GOOD. It's a fresh breath spray using our Thieves Mouthwash and Peppermint Vitality! Add both ingredients to a 5mL misting bottle and fill with distilled water. Use as desired. I keep one on my purse and one in the kitchen! Did anyone make this yet?! Who else loves it?! I'm completely obsessed. Did you know that Savvy Minerals make-up will not work as well without a primer? All mineral based make-up needs more to stick to than your skin so the coverage lasts all day and so you don't need to use as much foundation. There are several toxic free options from Young Living that'll work great! Check out this slide from our brand new Women's Wellness class (releasing online Monday morning!) for some ideas. If you love the DIY route... a little coconut oil, shea butter and essential oils will do the trick, too! Here's a recipe from one of our Gold leaders (Nina Backes) that you can whip up in just a few minutes. Mix all ingredients well together in a bowl and place into a four ounce glass jar. Use within two months. Mix everything together well in a bowl and store in a covered glass car for up to one month! Feel free to add other oils that'll love on your skin and libido! Follow up with some Lavender Hand & Body Lotion to lock in all the moisture. Having a good stock of oil blends is essential for a Young Living oiler! Blends give you the gift of benefiting from more expensive single oils that you may otherwise never order and they’re so easy to use. The name often clues you in on the support they offer (which is usually emotional, mental and spiritual) and they can be used aromatically and topically in these ways. Diffuse four to six drops. Diffuse three to four drops and mix it with a single oil it contains to stretch it further. Add twenty drops to a 10 mL roller along with ten drops of a single oil it contains and fill it up with V-6 to use as a perfume. This will last you weeks! Massage a drop over your heart throughout the day. Massage a drop into your temples and on the back of your neck each morning. Massage a drop into your scalp in the evenings before bed. When in doubt… these emotional helpers are best used from the neck up. They have an amazing ability to access the center of our brains where emotions are stored in processed. These oils calm it down and help us to process emotions in a healthier way. So amazing, right?! Here’s a list of ones I always keep on hand that are under $30. Awaken - This blend is so special because it is actually a combination of five different blends! If you have been wanting to try lots of emotionally supporting oils… order this first. It’s less expensive and gives you a lot for your money! Christmas Spirit - This blend is great all year round. It will give your home all the warm fuzzy vibes and will help you remember all the good parts of your childhood. Citrus Fresh - So much fresh goodness in one little bottle. It’s a combination of several citrus oils and Spearmint and it is just lovely diffused in the mornings to help everyone start the day with energy and positivity. En-R-Gee - The use is in the name! Diffuse this or use it as a perfume in the afternoons to get rid of that slump and to stay focused and energized. I think it smells even better when paired with Lime. EndoFlex - I use this oily daily over my adrenal glands to help me manage stress. Envision - This is a must have, friends! It’s actually under $20… making it an incredible gift for teachers, friends, etc. It helps you to be able to push past fears and insecurities to reach for the life you long for deeply. Exodus II - This blend is a powerhouse for your immune system. It has incredible cleansing abilities when applied to the bottoms of your feet and can calm scattered thoughts when massaged into your scalp. Family by Oola - We often diffuse this in the evenings during dinner time to help us focus on each other instead of the stresses of the day. Field by Oola - If you want some inspiration for your career… use Field by Oola as your daily perfume! Fitness by Oola - Are you struggling with keeping up with your fitness goals this year? Applying this to your feet in the morning will inspire you “get up and move”. Friends by Oola - I like diffusing this during girls nights and when I am feeling alone. It helps to remind me of all the wonderful people in my life that love and support me. Gentle Baby - If you have a baby… you need this blend. Our mamas of littles love massaging it onto their chests while they hold their infants to help soothe them. You can also dilute it and massage it into their feet before naps and bedtime. Gratitude - This is a favorite of mine to use when I am feeling overwhelmed. It helps me to focus on all the good in my life and how God goes before me to prepare good things for our family to walk into freely! Humility - Do you need a little help with more spiritual awareness? It takes getting our eyes off of ourselves and onto Jesus… and this blend always helps me do it. Into the Future - This blend helps you create a calming environment when you take time to look ahead to your hopes and dreams! I love diffusing it at the beginning of a new year or month… anytime you want a fresh start. JuvaFlex - For those nights when you have too many glasses of wine… apply this over your liver to help it process the alcohol more effectively! It’s also a must have for those of us that process more than normal toxins everyday like painters, hair stylists, etc. Melrose - This blend is a must have for clear skin! We also keep it on hand to massage on the outside of our ears to avoid discomfort during the winter months. Peace & Calming II - If you want the effects of Peace & Calming for around $10 less per bottle, you will love this blend. It is great diffused to made into a lotion to use in the evenings before bed. Purification - This is what we all turn to to get rid of odors! 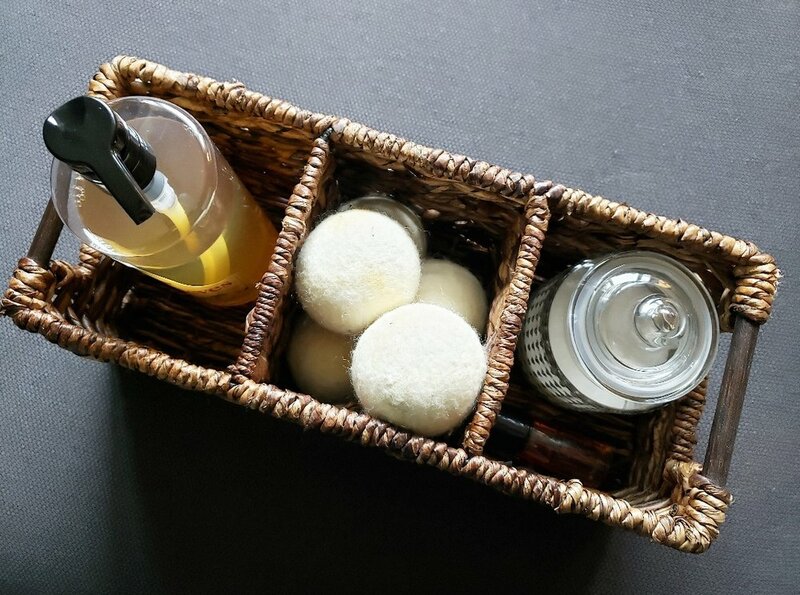 A few drops on dryer balls or in your trash can works wonders and it is wonderful diffused after cooking fish or in basements and campers where damp smells can be overwhelming. Lots of our members massage it into their dogs fur after a bath to avoid the wet dog smell, too! You can even use this to make a room or fabric freshening spray. RC - We diffuse this often during the winter months to keep our airways open. It makes a great chest rub when mixed with coconut oil, too! It’s less expensive than Raven so it’s a budget friendly favorite! Sara - This is a powerhouse for releasing deep rooted emotional trauma. Surrender - This is our son’s favorite blend and a favorite among many people with more intense, passionate personalities to help them release the need to control. Which ones do you have and love? Which one are you ordering next? If you do not know where to begin… start with the one that speaks to you the most and keep adding to your collection. Be sure to order them through Essential Rewards for the best price AND to help you scoop up for freebies each month! If you haven’t upgraded your membership with this free program yet… reach out to your Enroller to learn how. It’s easy and can be done online in just a few minutes!